(i) The surviving CPF beneficiaries who have retired from service between the period 18.11.1960 and 31.12.1985, and are in receipt of ex-gratia @ Rs. 600/ pm. w.e.f. 1.11.1997 under this Department’s OM No. 45/52/97-P&PW(E) dated 16.12.1997 & revised to Rs.3000, Rs.1000, Rs.750 & Rs.650 for Group A, B, C & D respectively w.e.f 4th June,2013 vide OM No.1/10/2012-P&PW(E) dtd. 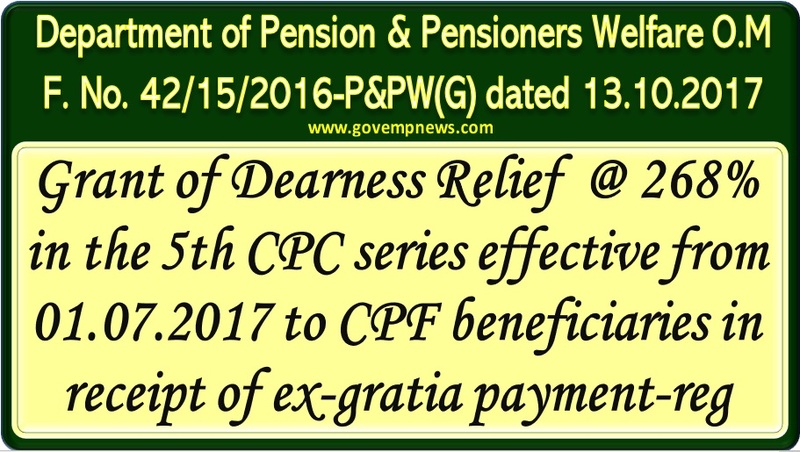 27th June, 2013 shall be entitled to enhanced Dearness Relief from 264% to 268% w.e.fo1.07.2017. (ii) The following categories of CPF beneficiaries who are in receipt of ex-gratia payment in terms of this Department’s OM No. 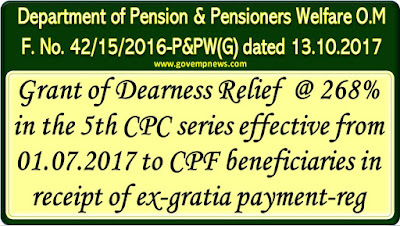 45/52/97-P&PW(E) dated 16.12.1997 shall be entitled to enhanced Dearness Relief from 256% to 260% w.e.f 01 072017. (a) The widows and eligible children of the deceased CPF beneficiary who had retired from service prior to 1.1.1986 or who had died while in service prior to 1.1.1986 and are in receipt of Ex-gratia payment of Rs. 605/- pm. & revised to Rs.645/-p.m w.e.f 04 June, 2013 vide OM No 1/10/2012-P&PW(E) dated 27‘h June,2013. 5. This issues in pursuance of Ministry of Finance, Department of Expenditure vide their OM No. 1. All Ministries/Departments of the Government of India/Chief Secretaries and AGs of all States/UTs. Please visit this Department’s website http://pensionersportal.gov. in for the orders on pension matters including above orders.